← Just What the Heck is an Uncountable Noun Anyway? Whether you are a fan of Netflix or prefer Amazon Prime, you’ve probably heard of Relatable, the new 67 minute-long standup by Ellen DeGeneres. The routine itself is the first time that DeGeneres has delivered something of this nature in 15 years. As the name suggests, the comedian shares amusing anecdotes about how even though she has attained celebrity status she, like many other individuals, has pushed through both large and small challenges. The idea of pushing through large and small challenges, while still remaining relatable, is something that every marketing department can and should (ironically) relate to. As DeGeneres shares at the beginning of the standup, before filming she had discussed her upcoming special with a friend, who asked her if “she was still relatable?” She promptly replies “yes” and then follows it up by discussing the art of the bath mat scoot. In 2019, marketing departments across industries should take note of DeGeneres comedic style and overarching message of being relatable. It is no longer enough to pretend that you “know” your audiences, especially if you are a Fortune 500 company whose top employees have little knowledge of the struggles that many individuals live on a daily basis. Instead, you must actually use your content marketing messages to show that you are relatable. However, as DeGeneres shows, being relatable doesn’t mean that you have to stop being humorous. If anything, being relatable will make your brand even more humorous (especially when pointing out ironic circumstances, such as the bath mat scoot that we have all inevitably done at some point in our lives). To create relatable marketing messages, brands can implement the following tips. Poke fun at instances where your brand hasn’t been relatable. For example, let’s say that your brand sells a line of luxurious skincare products. The fact that your hypothetical skincare line is expensive and endorsed by celebrities means that your brand might not be relatable to someone who has never been on the red carpet. To overcome this not relatable factor, you could have a celebrity make fun of the fact that rich or not, zits happen at the least opportune moments. Your audience will appreciate that you are acknowledging the fact that your skincare line is expensive, while simultaneously delivering a funny (and relatable) anecdote that subtly leads into the benefits of using your products. Perhaps you take the idea further by creating a social media post that says “And the award for leading zit goes to XYZ celebrity.” No matter how you want to play it, whether it’s in the title or the body, poking fun at the instances when your brand hasn’t been a relatable is an ironically easy way to make your brand more relatable to its intended audience. Promote customer success with authentic content. One of the easiest ways to create relatable blog posts is to create an authentic voice. Your authentic brand voice should focus on addressing the topics that people discuss on a daily basis. For example, most people have daily conversations about answering certain questions or overcoming challenges. While you might not be discussing the nuances of the bath mat scoot or the running down the hall because you forgot your towel, you can and should answer the questions that people might have about your products or services. In this vein, you can make your brand more relatable by helping people solve problems, offer advice to common challenges, and point people in the right direction. At the end of the day, being helpful with your content is a sure-fire way to increase authenticity while simultaneously remaining relatable. Tell a great story. As a writer, I am “programed” to love a good story. As a person, I find that stories are a great way to connect and build relationships. Marketing departments should always strive to tell a great (and you guessed it, relatable) story. Whether it is through powerful data, strong visual cues, or testimonials, your content marketing should create an engaging conversation. It should tell a story that your readers want to share; and like the best stories, your readers should be able to adapt it to meet their future storytelling needs. To use the earlier luxurious skincare example, let’s say that your brand is telling the story of the zit on the red carpet. By keeping the story amusing and relatable, people might be encouraged to share their own versions of inopportune blemishes. This type of interactive sharing offers the perfect platform to show how your product can help them to overcome their challenges. By offering a solution, or at the very least an “aha” moment, your brand’s story becomes the relatable solution that people want to share with their network of family, friends, and colleagues. As shown through DeGeneres’ breakthrough standup show, relatable comedy is not only successful, but it is here to stay. 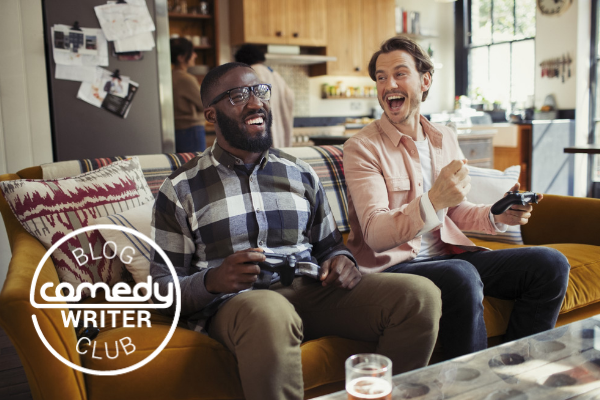 For marketers, relatable comedy can pave the way to stronger customer relationships that are authentic and long lasting. At the end of the day, relatable and humorous are a dynamic duo that can open new doors for even the most established brands.